A progress bar can be used to show a user how far along he/she is in a process. 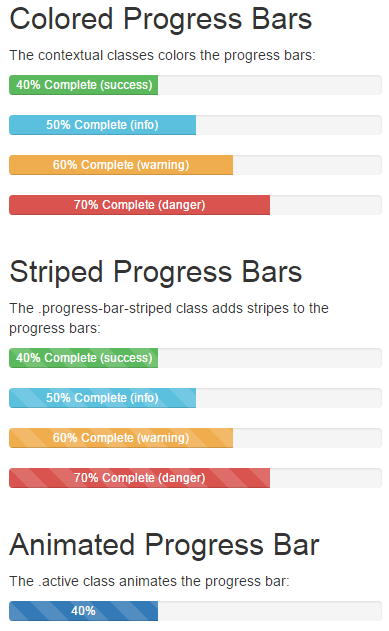 Bootstrap provides several types of progress bars. <div class="progress-bar progress-bar-info" role="progressbar" aria-valuenow="50" aria-valuemin="0" aria-valuemax="100"
<div class="progress-bar progress-bar-danger" role="progressbar" aria-valuenow="70" aria-valuemin="0" aria-valuemax="100"
<div class="progress-bar progress-bar-info progress-bar-striped" role="progressbar" aria-valuenow="50" aria-valuemin="0"